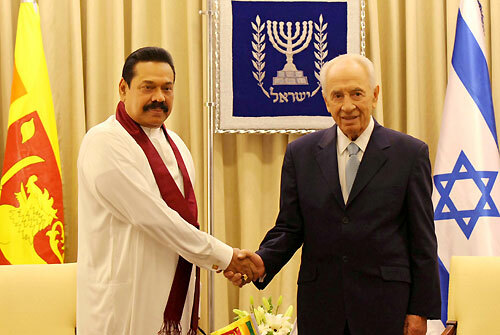 A bilateral discussion between President Mahinda Rajapaksa and his Israel counterpart Shimon Peres was held at the President’s Office in Jerusalem this morning on 09 January. Sri Lankan President arrived in Jerusalem yesterday (08) as the final destination on his Middle East tour which began with a 2-day state visit to Jordan last Saturday. President Rajapaksa stayed another 2 days in Palestine before he left for Israel. The two leaders focused attention to further strengthen bilateral relations between both countries. Attention was also focused on economic, business and tourism sectors. 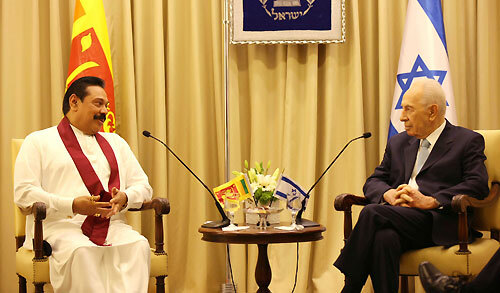 The President informed his Israeli counterpart on the post-war reconstruction and development progress as well as the economic progress achieved following elimination of terrorism in Sri Lanka. The President also elaborated on the rehabilitation and reconciliation process in Sri Lanka. Israeli President Peres explained on the ongoing peace process between Israel and Palestine. Israel’s National Defence Adviser Yossi Cohen, Head of the National Information Director’s Office Liran Dan, Israel’s non-resident Ambassador to Sri Lanka in New Delhi Alon Ushpiz, Israel’s Ambassador to the United States Ron Dermer were present at these discussions. Sri Lanka was represented by Minister Prof. G.L. Peiris, External Affairs Ministry Monitoring MP Sajin Vass Gunawardena, Parliamentarian Roshan Ranasinghe, President’s Secretary Lalith Weeratunge and Sri Lanka’s Ambassador to Israel Sarath Wijesinghe. 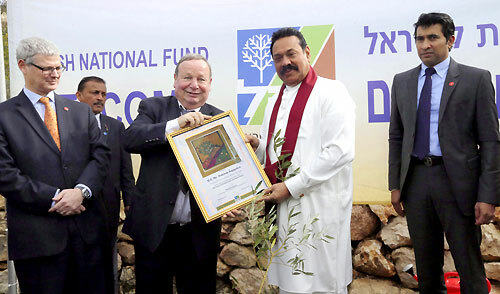 Later in the afternoon, President Rajapaksa visited the Grove of Nations Forest in Jerusalem following discussions with the Israeli President. The Grove of Nations is found in the Jerusalem Forest and makes up a part of the Olive Tree Route, a part of the initiative led by UNESCO and the Council of Europe to establish an Olive Tree Route around the entire Mediterranean basin expressing the common desire for peace and co-existence. 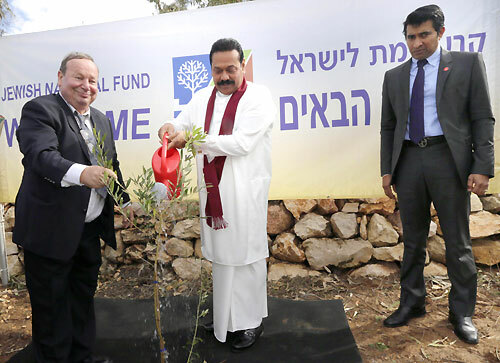 President Rajapaksa also planted an Olive tree in the National Park to mark his tour in Israel. He is the first Sri Lankan leader to visit Israel since its establishment in 1948.